Though Sri Lanka is very small in land area, the great diversity in habitats harbors are a rich and diverse fauna and flora, with many species endemic to the island. Historically as well as in the modern era, successive rulers and governments of Sri Lanka have strived to provide sanctuary and protection to our beautiful wildlife. Today the demands and aspirations of an expanding human population makes it difficult for the government to be solely responsible for the protection, preservation and management of this beguiled wild heritage of ours. Today, especially where human interest and wildlife interest are in direct conflict. It is imperative that private organizations with resources step into and fill the areas that need immediate attention: environmental education, long term research, and to develop integrated projects for community based conservation. Of the four species of wild cats found in Sri Lanka, the leopard is the largest. No information exists for all the species of cats in regard to their population, distribution and status. There is also small scale poaching of all the species of cats for their skins, teeth and meat. The sloth bear is the only species of bear found in Sri Lanka, further research is needed to find out more about its ecology, distribution and status. Of the five species of deer found in Sri Lanka, the spotted deer and its cousin, the sambar, have the largest distribution. Though there are still large populations of spotted deer in some areas, all five species of deer are relentlessly poached for venison. Studies to ascertain their ecology, distribution and status are urgently needed. Sri Lanka has more than 400 species of birds consisting of residents, visitors and migrants. Of this 26 species are endemic to the island. Large and small scale clearing of jungles and forests, causes local extinctions of the more specialized species, and threatens the survival of others. It is imperative to establish regional and urban wildlife sanctuaries for their long term survival. The inland waters of Sri Lanka have more than 60 species of fresh water fish of which over 24 species are only found in Sri Lanka. Closer to a 1,000 species of fish are found in the coastal waters surrounding the island. Domestic and industrial affluents and pollutants discharged into rivers and other waterways are a threat to the survival of these fresh water and coastal fishes, and other marine ecosystems such as coral reefs. The territorial waters of the Indian Ocean is also home to a rich and varied marine life. Five species of sea turtles and 25 species of whales and dolphins inhabit these coastal waters. Fifty three species of amphibians are found in Sri Lanka, of which over 25 species are endemic. The cobra is one of the most well known snakes of the over 90 species of snakes found in Sri Lanka. There are also many species of lizards, two species of crocodiles and monitors, two species of aquatic turtles and one species of tortoise found in the island. Of the diverse and amazing array of invertebrates found in Sri Lanka, there are over 240 species of butterflies, of which 14 species are endemic. 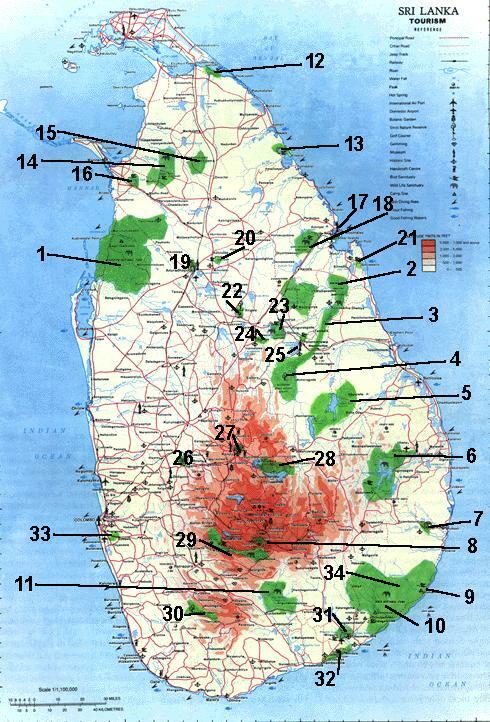 Sri Lanka also has a wealth of plant life of which a majority are endemic to the island. Many species of colorful and rare orchids, ferns, ayurvedic herbs and plants, large trees, bromeliads and epiphytes creates colorful, exotic and rich habitats for other animal life, and a salubrious environment for humans. The jungles of Sri Lanka abound in a variety of wildlife,which is surprising for an island of its size in the tropics.From ancient days the elephants and peacock from the Sri Lankan jungles were prize exports to the Kingdoms of East and West.But apart from these well known examples of the fauna, a visit to the Sri Lankan jungles is to enter a whole new world where nature has largely stayed still.There are four majour national parks.Of these the best known is Ruhunu National Park,at Yala,in the deep South of the island.The other well known national park,at Wilpattu,is at present closed due to the prevailing conditions in the North of the island.There are also two other national parks at Inginiyagala and Udawalawe. Sri Lanka has a rich and exotic variety of wildlife and a long tradition of conservation rooted in its 2,230 year old Buddhist civilisation. The following are the most important sanctuaries in terms of attractions, accessibility and availability of facilities. The theme of wildlife conservation has been an ancient concept in Sri Lanka. It was considered noble in keeping with the teachings of Gouthama Buddha and later essential to the Island. "...... ordering by beat of drum that no animals should be killed within a radius of seven gau from the city (Anuradhapura) the King gave security to animals. He gave security also to the fish in the twelve great tanks and bestowing on Kambodin-gold and cloth and whatever other kind of wealth they wished, he commanded them not to catch birds and so gave security to birds." Stone inscription at Ruwanveli Dagaba, Anuradhapura. Sri Lanka, because of her diverse physical environmental and tropical situation, harbours rich biological diversity of global significance far larger in proportion to her size. While her cultural traditions have always enshrined the concern for all life, the Island has nearly fourteen per cent of her land area earmarked for the conservation of biodiversity and wildlife. Of the fourteen per cent, twelve per cent are Protected Areas under the Department of Wildlife Conservation. This stands out in comparison with most other countries in South Asia Region. See list below for statistics on the numbered locations.